Negative externalities of economic development impact on the numerous areas and deteriorate quality of their resident’s life. Systems address these dramatic challenges through collaborative innovation of organizations, which, enabled by new technologies, create or capture attractive opportunities. 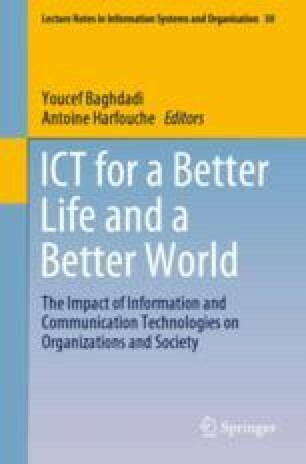 The aim of this paper is to highlight how Information and Communication Technology (ICT) plays a pivotal role in enabling the growth of new organizational forms, which create value at the territorial level, trigger positive changes in social and economic environment and improve the quality of life of people involved. Literature review considers the multiple perspectives of Institutional Entrepreneurship, Social Entrepreneurship, Socio-Ecological Systems and Socio-Technical Systems that until now were separate. This study highlights instead that their integration provides a satisfying explanation of the phenomena observed, and well explain different motivations of the examined organizations. ICT-based organizations, point out interesting opportunities for all organizations, public institutions, companies and social enterprises. In particular, the paper analyses a case of reutilization of fruit and vegetables surplus in the third Italian Agricultural centre. This action reduces production of waste and pollution, fights poverty and improves health, ultimately creating social inclusion. Brondizio, E.S., Ostrom, E., Young, O.R. : Connectivity and the governance of multilevel social-ecological systems: the role of social capital. Annu. Rev. Environ. Resour. 34, 253–278 (2009).